Brenda Joyner in The Glass Menagerie at Seattle Repertory Theatre, 2012. Photo by Alan Alabastro. 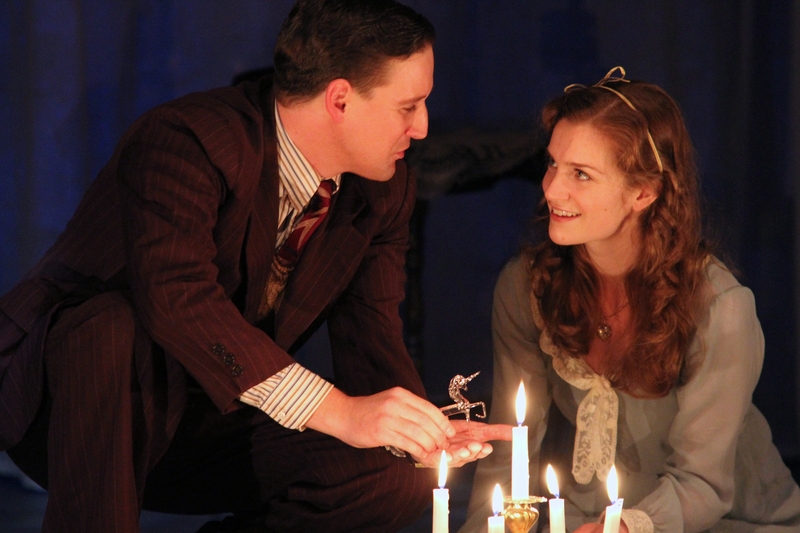 (l-r) Suzanne Bouchard and Ben Huber in The Glass Menagerie at Seattle Repertory Theatre, 2012. Photo by Alan Alabastro. Brenda Joyner faithfully brings the painfully shy and withdrawn sister Laura Wingfield to life. Joyner’s portrayal of Laura, a young lady as emotionally and socially crippled as she is physically handicapped will move audiences. Content to live in her own fantasy world based around her beloved glass menagerie and listening to music on her father’s victrola, she is besieged by a mother determined to relive her own youth through her, even though Laura is nothing like Amanda. The visceral terror that Joyner conveys in being forced by her mother to walk across the living room to open the door and greet her one “gentleman caller” is an emotional assault on your senses. Each painful step taken, grips your heart tighter and tighter. Huber admirably portrays the deeply conflicted son and play narrator, Tom Wingfield. While not physically handicapped like Laura, he is equally incapable of establishing emotional connections with others but unlike Laura he is unable to make peace with his own existence. Instead, he dreams of escaping the tediousness of his joyless job at the warehouse and the pettiness of the Wingfield home which traps him, much like the magician he describes to Laura as being nailed into a coffin. He sees himself similarly trapped by responsibility and guilt to his mother and sister, though his dream of escape are fanned by his vicarious experiences lived through late night outings to the movies and the books he reads, as well as through the fire escape, his desire to join the merchant marines and the very reality of his own father’s escaped. 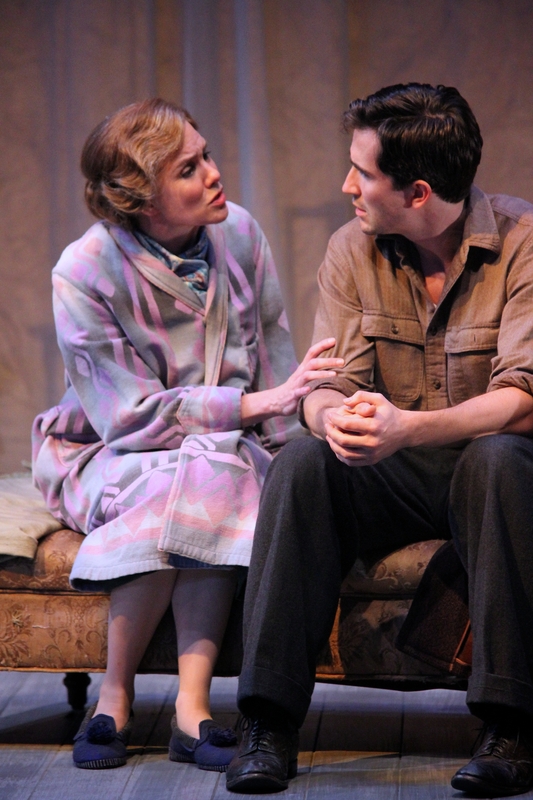 (l-r) Eric Riedmann and Brenda Joyner in The Glass Menagerie at Seattle Repertory Theatre, 2012. Photo by Alan Alabastro. 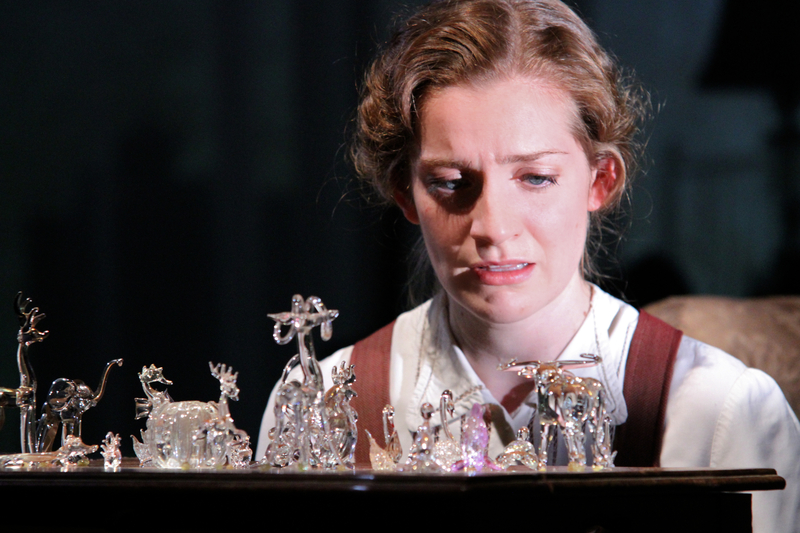 “The Glass Menagerie” is at times a sad and haunting play, but there is an abundance of elements for audiences to connect with which are strangely still relevant in our world today. A daughter unable to live up to her mother’s memories of her own childhood much less the unrealistic goals she dreams for her life. A son bereft of a father figure to guide him into mature manhood, forced to be leveraged as a pawn of his mother and consumed with guilt for wanting to escape the responsibilities of caring for his mother and sister. Menagerie forces us to consider the idea that perhaps normal and ‘fitting in’ are not the highest goals to aspire to. In a world where it is drilled into us since childhood that we need to dress and act like the cultural norm to have value, perhaps it is the one that resists the current of popular opinion who is really the master of their own fate. We might at first glance be tempted to write off Laura as broken, sadly strange and fragile when she may in fact possess the very qualities which make a person unique and an unexpected treasure. Like the glass unicorn in her menagerie Laura is the rare find, a diamond in the rough in a sea of humanity desperate seeking to fit in and be like one another, cookie cutter sheeple each with their iPhones, iPads and iPods, the new requirement for fitting in and a necessary supplement to one’s own fragile ego. Seattle Repertory does a remarkable job of bringing “The Glass Menagerie” alive through detailed and creative sets, inspired lighting and evocative music. The cast, including Eric Riedmann as Jim O’Connor Laura’s gentleman caller is excellent across the board and each brings a unique energy to their roles with Bouchard anchoring the superb cast. Do not miss out on seeing one of the first performances of “The Glass Menagerie” on stage in the Northwest since the 1970’s. Menagerie runs from October 26 through December 2 at the Seattle Repertory (www.seattlerep.org).